The book is a compilation of research articles read at the last year seminar held at the NEPC Tamil Literary Festival in Trincomalee on "The history of Eelam journalism," sources said. The Dean of the Art Faculty at East University Dr. Ms Ammankili Murugathas has written a chapter about the birth of national Tamil dailies and their contribution to Tamil literature in Sri Lanka. 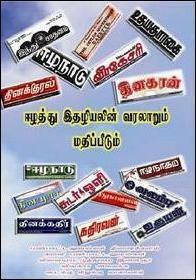 Assistant Director of Education Mr.N.Anandaraj has contributed an article on the development of Tamil journalism in Eelam after Sri Lanka gained independence. Dr.S.Yogarajah of East University has written on the development of Tamil literary magazines in Eelam. Another academician of the East University Ms Ruby Valentina Francis has done a research on the contribution of women writers for their cause through Eelam Tamil magazines. Provincial Assistant Director of Cultural Affairs Ms N.Sri Devi made the releasing address on the book. A well known author of several Tamil books Mr.N. Tharmarajah (Ahalankan) delivered the appreciation address. Provincial Education and Cultural Ministry Secretary Mr.R.Thiagalingam said in the preface that the book could be considered as a base for students who follow journalism and to those interested in pursuing research on the subject.